Hart Roofing and Renovations Inc.
We are residential roofer serving properties city-wide and throughout the surrounding municipalities. Our services include installing and repairing architectural, laminated fiberglass shingles, flat roofing, soffits, fascia, eavestroughing, and vinyl and cement board siding. Hart Roofing and Renovations is a roofing contractor offering new roofing, reroofing, and repairs for new construction or home improvements. Our successful projects have included everything from roofing, soffit, fascia and eave installation on small sunroom additions on existing single family residences, to new custom homes, to personal care homes and large multifamily communities. We know that your roof is protecting your greatest assets- your home and your family. That is why honesty and integrity are cornerstones of our business. 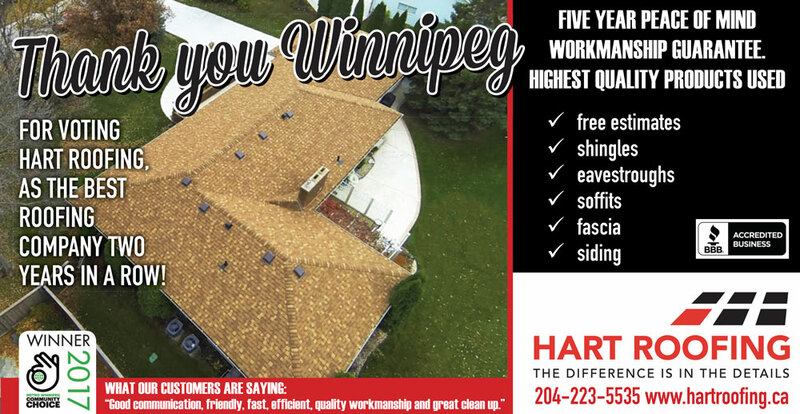 We’ve worked exceptionally hard to earn the trust and confidence of Winnipeg homeowners and builders, aiming to be one of the best roofing companies in the area. Hart Roofing is committed to offering the highest quality product available while delivering a level of service excellence that exceeds our client’s expectations enabling us to build our business on the many referrals from our satisfied customers. 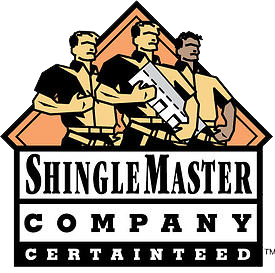 We use shingles from leading manufacturers like Certainteed and BP. Our workmanship is backed by a 5 year warranty. 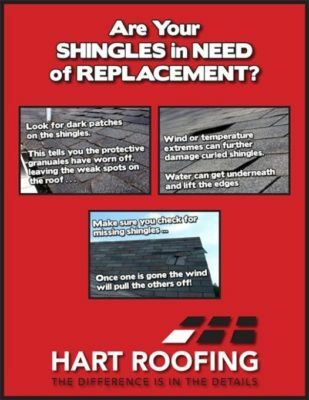 Hart Roofing and Renovations is a Certainteed Select Shingle Master certified Company. This enables us to offer you the homeowner the opportunity to obtain a 4 star warranty. Click on the Shingle Master icon for more detailed information. When fixing a commercial roof or flat residential roof, Hart Roofing knows how important it is to get the job done on time and on budget. Whether you need help finding and repairing leaks, strip large areas of roof and reinstall a system, install a new roofing system or install curbs for HVAC units, whatever your flat roofing needs, Hart Roofing is there for you. Our services include EPDM, mod-bit, PVC, and tar and gravel. We replace metal flashings, coping and sealants and drain scrupper extensions and roof drains. If you need to undertake a repair to your existing flat roof or install a new flat roof for your commercial or residential building contact us today. Hart Roofing offers a complete roofing system renovation. We use top quality products from Kaycan. New siding, vinyl or cement board, soffits, fascia, eaves and trim will give you years of protection from moisture and pest intrusion. They will immediately improve the appearance of your home. Your homes curb appeal can be greatly improved with quality exterior products installed by a reliable and professional roofing contractor. The homeowner is protected by full liability insurance and Workers Compensation protects our workers. Visualize your dream home with Certainteed Landmark and Kaycan Aluminum color combinations! Count on Hart Roofing and Renovations Inc. to help protect it.